Did you know there are two Yorktown’s and that General Rochambeau was connected to both? The more famous Yorktown is the small town on the bluff overlooking the mouth of the York River in Virginia. It was there that British General Lord Cornwallis made his final stand against the Continental rebels and the French Army under Rochambeau. This battle, overwhelmingly won by the Frenco-American allies, determined the outcome of the American Revolution and the birth of the United States of America. The lesser-known Yorktown is in New York state. It is located in northern portion of Westchester County. According to Rice and Brown, Verger’s journal, Rochambeau and his French Army camped in Crompound, a community within in the the town of Yorktown, New York. They remained there for a month (September 24 – October 21, 1782) near George Washington’s Newburgh Headquarters. Rochambeau, having aided Washington in the successful siege against Cornwallis at the battle of Yorktown, Virginia, was retracing his route north for a final farewell to the American general. Rochambeau’s army would continue on to Boston for their embarkation from America on December 24, 1782. whereas Rochambeau, himself, returned to Annapolis, Maryland, from whence he sailed, (January 29, 1783). 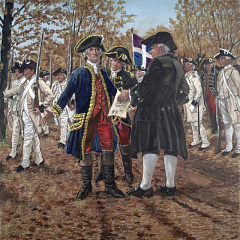 Rochambeau did not quit the area, now allied French Hill, without incident, however. According to Jean-Baptiste-Antoine de Verger, on the night before leaving Yorktown, New York, the French general was in his room when an American asked to speak with him. It was a sheriff (or perhaps the mayor; more likely a New York militiaman.) who put his hand on Rochambeau’s shoulder saying that he was sorry, but he must arrest him for an unpaid bill owed to the locals. The general, “more surprised than angered by the sheriff’s insolence, advised him to make himself scarce very quickly if he did not want to become a prisoner himself, which advice the latter deemed expedient to follow.” No wonder, since Rochambeau was surrounded by thousands of his troops. No match for the sheriff! There are several accounts of this story with differing outcomes. Verger continued that Rochambeau wrote Washington telling him of the incident and that Washington sent his dragoons to arrest the man and send him to prison in Philadelphia. Again, always the diplomat, Rochambeau asked for him to be freed. In Rochambeau’s journal he remembered the incident in this way. A captain in the American militia demanded payment of 15,000 francs for wood used for fuel by the Soissonnais regiment. He wrote that the matter was referred to Villemanzy, the commissary named to settle this affair, who finally gave it over to arbitration with the locals. They in turn reminded the arbiters of the aid that the French had rendered to America. In the end, the cost was reduced to 2,000 francs and “cast the plaintiff in the whole of the costs.” (taken from Rochambeau’s journal).